A collection of provocative essays on culture in the best tradition of Marxism. By showing how the encounter of culture and class with the moments of critique and autonomy pertains to ever-changing situations, Ghosh highlights the importance of contingency and indeterminacy of any critique and autonomous culture, thereby introducing within Marxism a certain self-reflexivity and open-endedness that makes the proposed theoretical frame special. The essays in the book cover issues that are of great importance to the praxis of revolutionary transformation at a moment when communist revolutionaries are a major internal security obsession. Readers who persevere will find in this intellectually stimulating endeavour much food for thought because it offers a new vantage point to look at social existence and the need to transform it. Can history be made as we please? 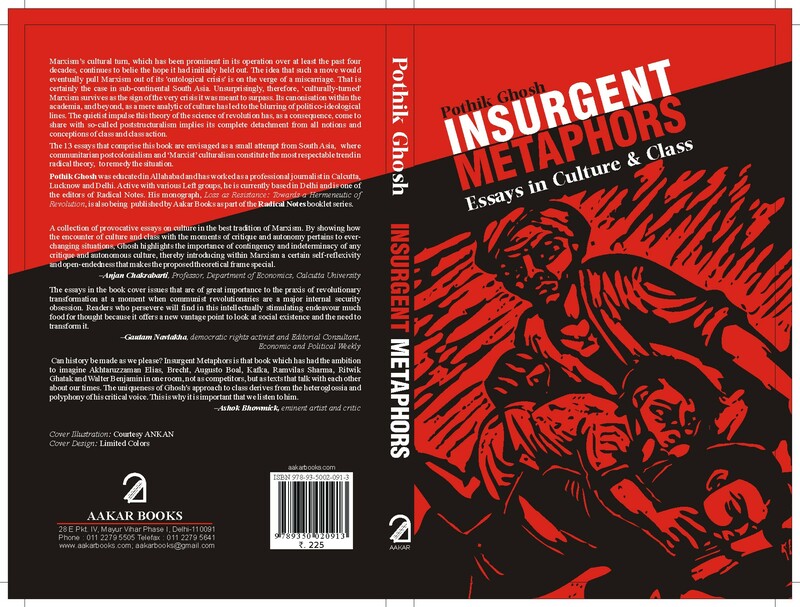 Insurgent Metaphors is that book which has had the ambition to imagine Akhtaruzzaman Elias, Brecht, Augusto Boal, Kafka, Ramvilas Sharma, Ritwik Ghatak and Walter Benjamin in one room, not as competitors, but as texts that talk with each other about our times. The uniqueness of Ghosh’s approach to class derives from the heteroglossia and polyphony of his critical voice. This is why it is important that we listen to him. Pothik Ghosh was educated in Allahabad and has worked as a professional journalist in Calcutta, Lucknow and Delhi. Active with various Left groups, he is currently based in Delhi and is one of the editors of Radical Notes. His monograph, Loss as Resistance: Towards a Hermeneutic of Revolution, too has just been published by Aakar Books as part of the Radical Notes booklet series.